Long ago, there lived a king called Bhoj who believed that his love and concern for his subjects was unmatched. Consider this: A powerful ruler, not too modest about his exceptional accomplishments, keen to be recognised as the ‘Greatest Ever’, more than a little upset by some critics always comparing him unfavourably with a legendary predecessor in the past and pricking the bloated balloons floated by sycophants; and then a contender who refuses to be written off despite repeated failures, posturing as a knight in shining armour who can slay any dragon. It may sound familiar in the present context, but what we are talking about is a minor Sanskrit classic Dvatrimsat Puttalika credited to the 11th century Sanskrit poet from Kashmir, Kshemendra. It has ever since been translated into many Indian languages and the Hindi version is popular as Singhasan Battisi. Long ago, there lived a king called Bhoj who believed that his love and concern for his subjects was unmatched. When a gorgeous throne adorned with 32 life-sized statues of exquisitely beautiful celestial nymphs was excavated, he was convinced that this was meant for him. 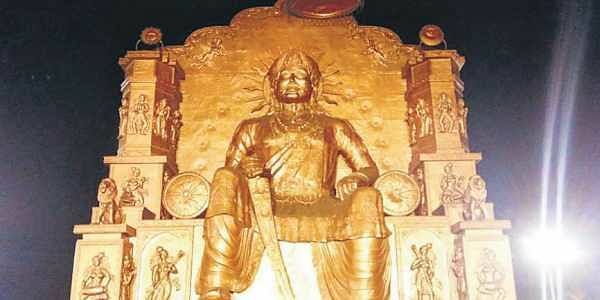 As soon as Raja Bhoj prepared to seat himself on the throne, a statue came to life and asked him to wait till he had heard a story about Vikramaditya to whom the seat had once belonged. If he considered himself a worthy inheritor equal in virtue and justice only then should he dare to rest on the cushion placed. The process was repeated 32 times. After the last nymph had finished her tale and Bhoj was still engrossed in his thoughts, the apsaras picked up the throne and flew away shattering his dream of reigning like the legendary Vikramaditya. Times have changed, and the tale survives largely in its illustrated comics avatar. However, one is strongly tempted to use it metaphorically at election time. Replace the statues with 32 constituencies, carefully chosen to represent obstacles to any ruler’s ambitions. Can these ‘temptresses’ assure or deny the coveted throne to the contender? To assume the reins of government, a political party has to win a majority of seats in the Lok Sabha. At present, 543 seats are being contested. In 2014, the BJP-NDA combine had managed to register an impressive victory ending three decades of coalition government. The question is: Can it repeat the performance? Last time, the BJP and its partners had virtually annihilated Opposition in the Hindi belt. Uttar Pradesh, Uttarakhand, Delhi, Haryana, Rajasthan, Madhya Pradesh, Chhattisgarh and Jharkhand had experienced a tsunami of ‘Modi Wave’. Nitish Kumar in Bihar wavered for a while but ultimately fell in line. All this is water under the bridge. The BJP had dramatically risen to power on the slogan of ‘Congress Mukt Bharat’. Indeed, for some time large parts on the map of India were painted saffron. Slowly, over the past year-and-a-half the wave seems to be subsiding. Rajasthan, Madhya Pradesh and Chhattisgarh have slipped out of the BJP’s bag. These three states alone account for 65 Lok Sabha seats. The BJP can’t be expected to record ‘perfect’ scores here as it did last time. UP too, with SP-BSP alliance in place, presents a daunting challenge. Add to this tally the numbers from Tamil Nadu and West Bengal where neither the BJP nor the Congress has a presence worth mentioning. For past three decades and more it’s the regional parties that have ruled here. Andhra Pradesh and Odisha remain to be counted. So what are the stories the ‘statuesque constituencies’ telling us? We are not inviting our readers to indulge in fruitless forecasting. Let professional psephologists practice their craft. But it may be well our worth to identify 32 (or a few more) constituencies from all over India that promise to provide insights about democracy in India. Memories are fading fast but some are at least moss green yet of rulers just and fair—provincial satraps, chief ministers and regional representatives in the Central Cabinet who were real leaders—and not created by the media. They articulated aspirations of their people. They were legends in their lifetime—Sheikh Abdullah, Biju Patnaik, Mohan Lal Sukhadia, Bidhan Chandra Roy, Jyoti Basu and many more. Some died in their prime, others couldn’t escape a taint of corruption or resist the temptation of dynasty. The ‘inheritors’ from Kashmir to Kanyakumari and Kamrup to Kutch are arrayed in a dubious battle with ‘carpet baggers’. The worry is that even chance and happenstance can be subverted by diabolical design. It is time to return to Singhasan Battisi. The cycle of stories is meant to teach lessons not only to common readers but also to serve as a reminder to the rulers of their responsibilities.